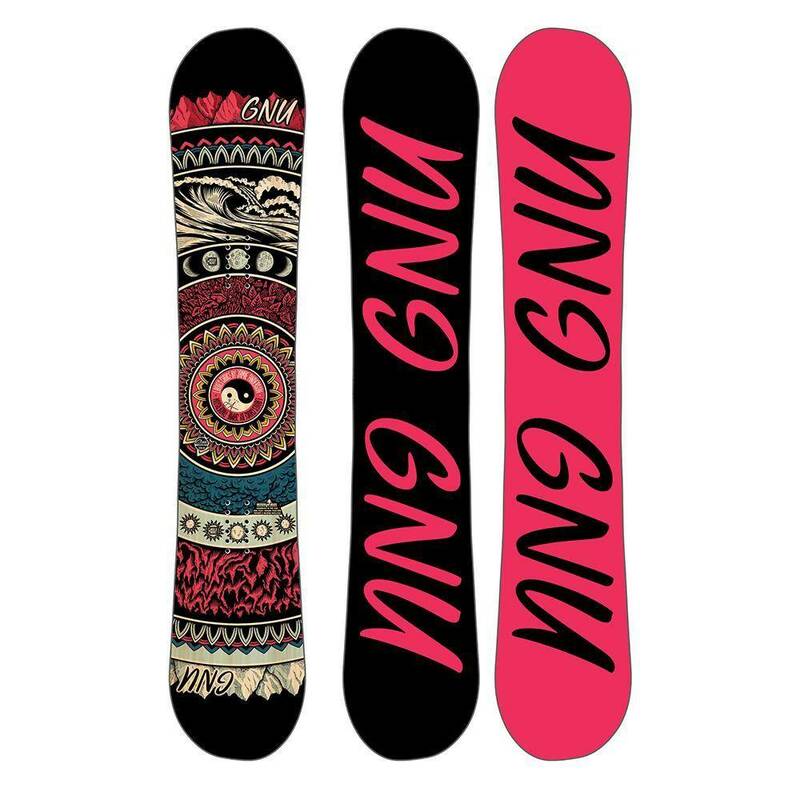 The 2019 Gnu Ladies Choice is the board of Choice for Gnu team rider Jamie Anderson, and if you're not too familiar with her she, won Gold in slopestyle and silver in big air at the 2018 Winter Olympics pretty much every other big snowboarding competition all while riding the Ladies Choice. Don't think this is just a park board though, it can go everywhere you want to, and do it well. It handles jumps like a dream, tackles rails without a worry, and can carve and slash powder and groomers with the best freeride boards around. This is all thanks to an ideal camber/rocker blend along with an asymmetrical construction, giving you float, pop, and power in all aspects of your riding. The Ladies Choice is one of the most versatile boards in the Gnu lineup, make it your choice and you're ready for anything. 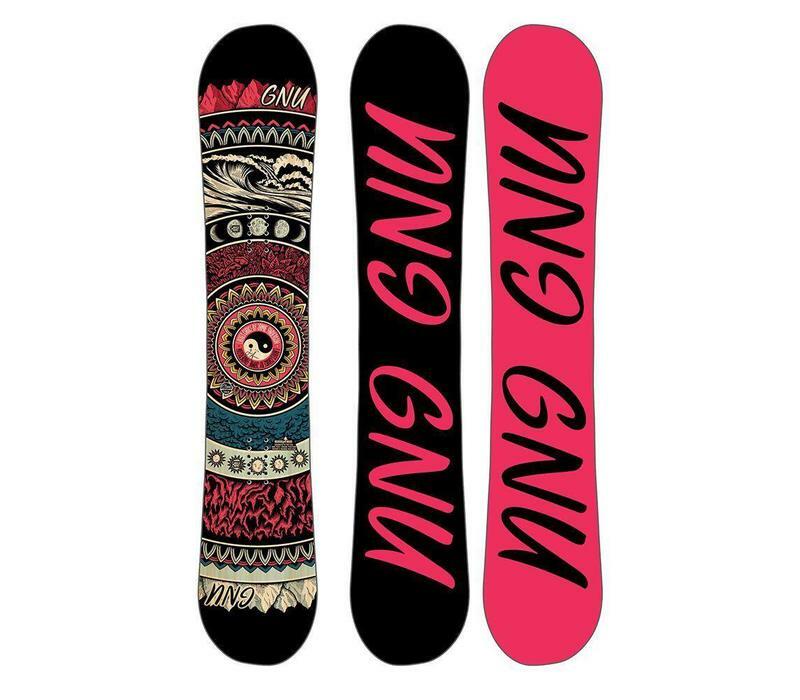 Shortened rocker between your feet with lengthened camber to the tip and tail gives you power and pop on groomers and in the park along with float and freedom to charge through powder. More loaded pressure in the tip and tail than regular C2 for a more aggressive and stable ride. Identical tip to tail for controlled riding in regular or switch, with an asymmetric construction from toe to heel. Our bodies aren't the same front to back, so why should our boards be? Asymmetrical boards are built with a shorter sidecut on the heel edge and a different core construction from toe to heel, resulting in more precise carves on your toes, and easier and more powerful turns on your heels. This board is a level 2 on the asym scale, featuring an asymmetrical sidecut, core, and contact points. The lightest, environmentally nicest, and smoothest core from Gnu. Combines Aspen, Balsa, and Paulownia woods with Triax and Biax alloy glass for a super smooth ride and lighter weight. Strong, fast and holds wax well. Glide over flat spots and wet spring snow with less drag and more speed. Recycled UHMW Sidewalls - Environmentally friendly sidewall construction that's tough and fast. Silky Smooth Bio Fibres - Renewable organic fibres that reduce vibration in the board, making your ride much smoother.